I was recently part of a Tourism New Zealand/Canon Video/Photo crew and took along a Hitachi SimpleTough 500gb Portable Storage drive to review and backup my photos as I expected our backpacks would be treated roughly during car/plane/helicopter transfers. 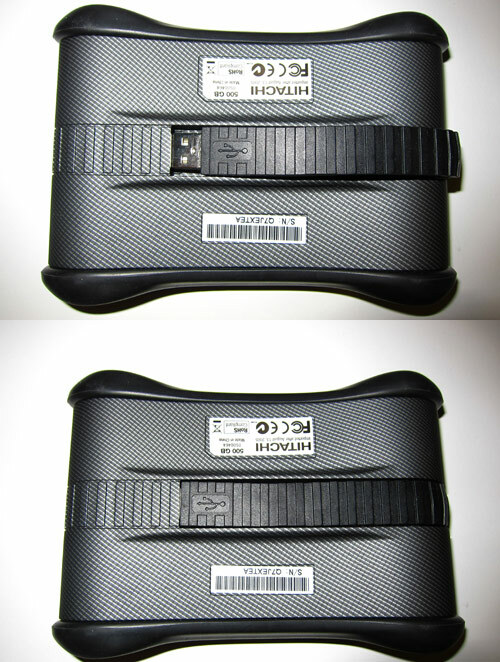 I copied photos from my camera’s SDHC storage cards to the Hitachi SimpleTough Portable Storage Drive as often as possible, after viewing them on my Kogan Netbook Pro and deleting badly taken photos. The drive performed as well as a portable USB2 hard drive can be expected to in terms of file transfer speeds (which means it was frustrating slow as I was transferring many GB of photos). I can’t wait for the widespread adoption of faster USB 3 portable storage, as I said recently during an interview about USB 3 with Radio Australia’s Tech Stream program. There’s a saying in backup circles that there’s really only two types of hard drive. Those that have failed, and those that have yet to fail. We’ve seen it attributed to many sources, but no matter the original author, it’s still stunningly true. A caterpillar-style tank tread runs the length of the base of this larger than average external drive, but it’s not just for show. It unrolls out to reveal a USB 2.0 type A plug on a sealed cable. On the plus side, this means it powers from a single USB cable. On the minus side, if something goes wrong with the USB connector, it’s goodbye drive. The Hitachi SimpleTOUGH external hard drive’s rugged enclosure and embedded USB cable make it a great companion for road warriors. If you plan to knock your hard drive about during travel, this would be a good choice. The USB 2.0 cable has been embedded directly into the hard drive so it never gets lost. It’s not quite sealed when inserted back into the drive, however, so we doubt it’s fully protected against contact with liquid. I picked up one of these a couple of weeks ago. 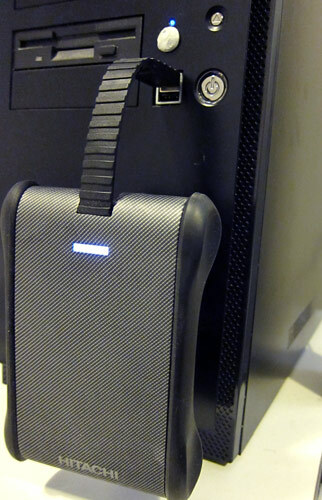 The concept of a good ruggedized portable USB hard drive for the consumer market is LONG overdue. The 500GB SimpleTough worked fine the first few times I used it, plugging the fold out USB ribbon cable into a laptop or desktop…everything seemed ok and it worked like a champ…and was faster than any other external USB drive of its size that I’ve ever used. Now all of a sudden I start getting “Device Not Recognized”, no matter what laptop or desktop, USB port, or even USB hub (powered) that I plugged it into, and regardless of OS (using XP or Vista). After several iterations of patiently unplugging it, letting it spin down for a minute, then plugging it back in…still not recognized. So during my last attempt I was going to give up, box it back up and return it…I started to reach to unplug the drive and lifted it up off of my desk a little bit…and suddenly…it WORKED and my system recognized it. So I tried the theory, I unplugged it again, let it sit, plugged it back in while it was sitting flat…didn’t work…then as soon as I elevated it to about a 45 degree angle off my desk it was recognized and worked again. Diagnosis…bad USB ribbon cable, and bad workmanship. I have treated this drive with kid gloves and it never got any kind of abuse, period. The drive may be ruggedized, but clearly the ribbon cable is a serious Achilles heel. After less than 3 weeks it stopped working. It may be rugged as per the case construction, but the cable is flimsy and the connection intermittent. I now cannot access my data as the driver is not recognized (and have not been able to find a new one to download). Customer service is a nightmare…. I have called 5 times, waiting up to 25 minutes; no one answers. Same applies to email requests for service. So I would not recommend the product nor the customer service. Pretty horrible. DO not buy this drive; It is an absolute garbage. It was a good idea to include the USB cable. It was a cute idea to have a notch on the device where the cable can be stored for convenience. Not such a great idea to have one end permanently molded to the device. It was a terrible idea to have a ribbon cable with zero flexibility on one axis. It is a horrendous design to have such a short cable — about 4 inches, that the drive will hang in mid-air if you connect to the front USB port on a desk top. I am not sure how “rugged” the drive mechanism is, but the cable is as finicky and flimsy it can be. My experience is identical to the other posters who got “unrecognized device” message after a while. It does it all the time and I was lucky to get my data out of the device. I am just waiting for the next successful connection to format it so that I can return it. All in all, the design is so bad to make the device unusable after about a month, if that long. At first the Hitachi SimpleTough Portable Storage Drive “tank tread” style built-in USB2 cable seemed like a good innovation which meant purchasers didn’t have to carry a separate loose USB cable that could get lost easily. However the majority of reviews by purchasers of the drive on Amazon.com are very angry as the cable is unreliable and often causes access to the drive to fail. So my recommendation is do not buy any products from the Hitachi SimpleTough Portable Storage Drive series as long as they continue to have this USB2 cable design flaw. Just wanted to say thankyou for your well-researched review. It has been very useful for me when considering whether or not to buy this drive. Neither my notebook, nor my desktop recognizes the Hitachi Portable Drive. I try to find teh drivers on the Intenret, with zero success. These are on the drive, but if the drive can not be accessed it is of no use. Hitachi, why not help customers solving such an easy problem by placing all the drivers on your websites for customers to downlaad.? I tried several different USB cables, but no cable gave me access to the drive. Please advice me what to do. I have only just heard about these, sounds like what I need after a slight slip meant my external hard drive fell approx 60cm to a timber/carpet floor. No longer working. If the main problem is the short inflexible USB cable, why not carry an extension USB cable then you can place it where ever is most convenient and not put any strain on the inbuilt cable. Means something extra to carry but if otherwise a very good piece of equipment then its not too much trouble. I have never had a single problem with this drive! Other than that it now appears to be discontinued lol. my hitachi external drives was busted already, after almost a year of using it. all important files was lost and corrupted. The painful part is, all my pictures was GONE as in totally GONE! It is piece of junk. I have lost all my data and I don’t have any idea to recover.